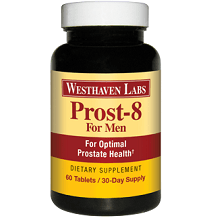 In this Westhaven Labs Prost-8 review, we aim to find out whether this supplement for prostate health actually delivers what it promises. According to the manufacturer, Prost-8 uses natural ingredients to promote optimal prostate health. The question now is whether this supplement can produce results. If you are wondering whether Prost-8 is for you, read on for all the details. The ingredients used for Prost-8 have been found to have some positive effects on the symptoms of enlarged prostate with the possibility of shrinking the prostate too. The presence of Beta-Sitosterol is worth noting as this ingredient appears to be useful in treating various prostate issues such as nighttime urination. Both zinc and pumpkin seed oil are believed to help shrink the prostate. The manufacturer recommends that you take two tablets per day. There is no indication when to take them or whether they should be taken before, during or after a meal. We were not able to find any documentation of side effects from using Prost-8. Customer reviews were sparse as of the time of writing. It is recommended that you consult your doctor first prior to using this product especially when you are taking other medications to avoid any side effects. At the time we reviewed this product, you could purchase a 60-tablet bottle (one month’s supply) of Prost-8 from the manufacturer’s website for $29.95. You could buy a three-month supply for $59.95 while a six-month supply would set you back $89.95. Westhaven Labs offers a 100% satisfaction guaranteed refund policy. Simply return all products for which you want a refund, within 120 days of purchase. Based on all the data that we have gathered for our Westhaven Labs Prost-8 review, we have come to the conclusion that this product may not provide the results that you need. Although the price is reasonable compared to other prostate supplements, it is still a bit expensive. 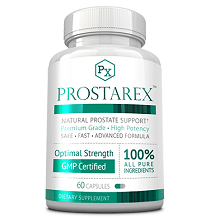 We like the inclusion of Beta-Sitosterol Complex (which is common in many prostate supplements) but feel the ingredient list is still limited. We are also concerned that there is not much product information available from the company’s website. We feel that there are other better supplements for prostate available.